Were they asked, keen observers of the March 2019 Perfect Liars Club would unanimously agree -- this show had everything. A sold out and boisterous crowd. A special mystery guest. A "Happy Birthday" sing-a-long. A stellar lineup of tellers. And one story so rich, so ribald, so revealing... the performer asked that it not be recorded, confining this bawdy tale within the beer can adorned walls of the Bier Baron Tavern and DC Comedy Loft. And were that not enough, the honor of DC's best and brightest was also on the line. 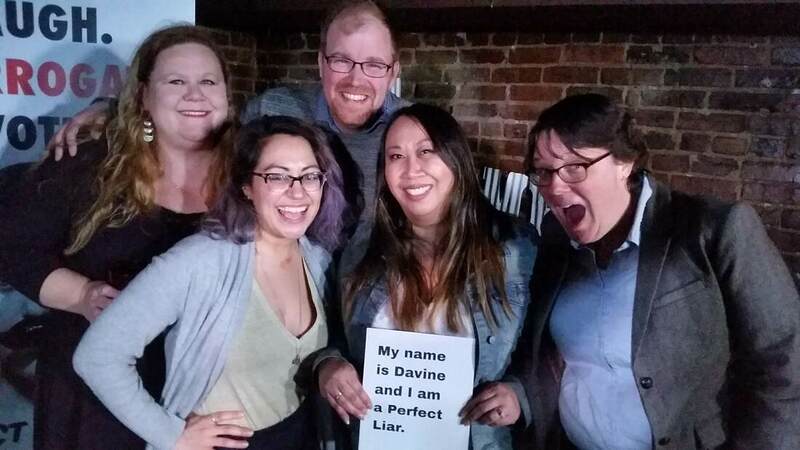 Our legion of loyal sleuthers had finally spotted a liar at February's show. And as they crammed into every nook and cranny of the popular Dupont Circle watering hole, one couldn't help but be impressed by their unmerited level of confidence. Would the truth prevail? Or, would another liar go unspotted? It was story time. Did amateur suburban detective Davine blow the whistle on her neighbor when she suspected that his love of exotic foods had gotten so out of control, he was shopping for dinner options at the local PetSmart? Was self-professed band nerd and budding middle school playwright Tori's family-friendly and "based on actual events" play produced as part of a local theatre festival that featured predominantly X-rated content? Did Graham's average Wednesday evening become an incredibly above-average Wednesday night after he struck up a friendly conversation with a patron sitting next to him at his favorite neighborhood bar? Did tour leader and self-appointed "student confidante" Debbie get a little too close for comfort with one of her charges after a sick teen urinated on her in the waiting room of an Israeli emergency room? Were the show to end then and there, everyone would have undoubtedly gone home happy, grinning from ear to ear after hearing those tall tales told terrifically. Little did they know, the stories were mere appetizers to the main course of an interrogation to come. Where was Davine's neighbor's house in relation to hers? What was the name of the local publication that interviewed Tori about her play? What was the name of the DC hotel bar where Graham's interesting evening all began? Why was Israeli food causing Debbie's tour group to experience so much stomach distress? Question upon humorous question was posed to our four suspicious storytellers. Nonetheless, it quickly grew apparent that no matter the sincerity of one performer's earnest responses, the overwhelming majority was convinced that Graham was lying. A hypothesis that was validated by a vote that had Graham more than doubling the tally of his nearest competitor, Tori, netting a total of 42 raised hands to her 20. Debbie and Davine rounded out the quartet, sharing 12 votes apiece. Was it that easy? Had the hunches of the bunches prevailed? Was Graham's unrecordable story just too good to be believed? The drum roll sounded. The storytellers jostled for position. Anticipation hit a fever pitch. And then... Davine strutted to center stage, another Perfect Liar overlooked by an overconfident crowd. Ladies and gentlemen, this truly was a show for the ages. Until the next one.